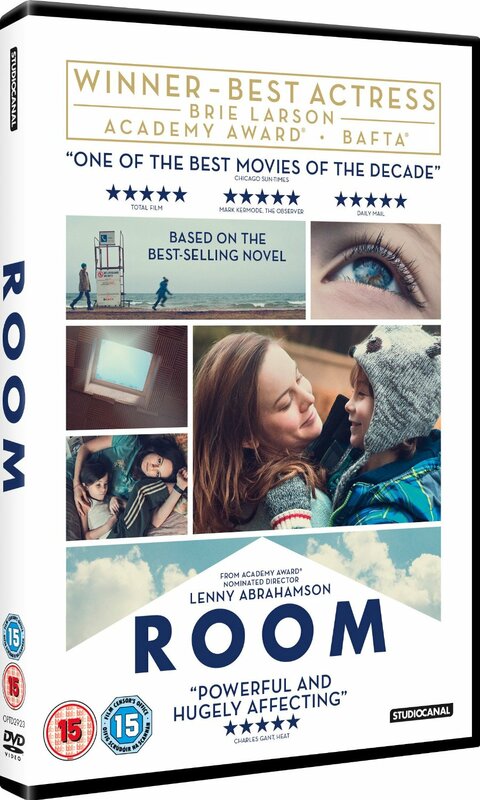 Today 9th May is 2016 is the release date for the multi award winning ROOM on DVD and Blueray I am a huge fan of the book which I will definitely be reading again and Stuart and I went to see the film in the cinema back in February on our anniversary. Directed by Academy Award® nominated Lenny Abrahamson (with a screenplay by Emma Donoghue that she adapted from her best-selling novel, ROOM stars Brie Larson, Jacob Tremblay, Joan Allen, William H. Macy and Sean Bridgers, ROOM is one of the most highly acclaimed films of the year. Room tells the extraordinary story of Jack (Jacob Tremblay), a spirited 5-year-old who is looked after by his loving and devoted mother (Brie Larson). Like any good mother, Ma dedicates herself to keeping Jack happy and safe, nurturing him with warmth and love and doing typical things like playing games and telling stories. Their life, however, is anything but typical--they are trapped--confined to a 10-by-10-foot space that Ma has euphemistically named Room. Ma has created a whole universe for Jack within Room, and she will stop at nothing to ensure that, even in this treacherous environment, Jack is able to live a complete and fulfilling life. But as Jack's curiosity about their situation grows, and Ma's resilience reaches its breaking point, they enact a risky plan to escape, ultimately bringing them face-to-face with what may turn out to be the scariest thing yet: the real world. I find that when a book becomes a film most of the time I prefer the book however I love both the book and film both the same with ROOM. Its an emotional, powerful and gripping film even though it has a quite depressing theme the acting is brilliant from both Brie Larson and Jacob Tremblay. Now I have the chance for one of my readers to win a copy of ROOM on DVD or Blueray. I know the film won awards so I would like to see it. My mam really wants to see it because it is based on the book and looks really good. I want to see it too because I have already seen the silver and it looks like a very interesting film. I have been told this is an excellent film. I haven't read the book yet but it's on y to read list, so I would probably read it a bit quicker if I won! I've read the book and it was fantastic, loved it! Am very interested to see how it's been adapted for film! Because I loved the book and really want to have a copy of the film too! I would like to win the DVD, as I have not seen the film ROOM as yet. Also I would share it with my Mum. I haven't read the book or seen the film but i love reading and now i want to see the film too. I adored the trailer when I saw it but never got round to seeing it and I really want to! I want to win because I didn't get the chance to see it in cinema and the trailer looked incredible! I'd like to win because I like the sound of the film and would like to watch it. Sounds like a very interesting plot. Going to have to watch the film for myself now. I haven't seen it but I would love to and then my mum and sister could watch it. This looks great, amazing reviews! I've been wanting to see this film but with small children I never get the chance to go to the cinema any more. Have heard such good things about it, but haven't seen it or read the book (yet!). I would love to win because my sister loves the book and the film and thinks I will too. I would like to win because it's a film I'd like to watch! I nearly went to the cinema to see it, but I didn't have enough money. I love the storyline to this film. Would rather watch it on DVD rather than reading the book. I have read some great reviews and about the film and I would like to see it. Remember watching the trailer and marking this one down as a must see when it came out on DVD. I think it's one of those deep, thoughtful films that you watch with close friends and chat over rather than a fun, big screen cinema experience...it's a keeper though! I love the book and seeing the film would be fab! I would love to win this dvd, it sounds an ideal family film about a doting mother looking out for her child. I've heard lots of good things about this film, but I never get chance to go to the cinema, so the dvd would be great for me! well i've heard it is excellent so would like to see it! I loved the book but haven't seen the film yet, so this would be great. I would like to win as i've heard fantastic things about this movie and i would love to see it while enjoying eating some yummy popcorn. I would love to win because I haven't watched this yet and want to! Friday nights are movie nights so it'll be great to have a non-action option for a change! I've read the book and thoroughly enjoyed it. I would love to now see the film. It looks a truly amazing film. I would like to win because I love the book and have heard some good reviews about the film. I would love to watch this film, it is on my list! I wonder if the film is in any way like the book and what changes they've made to it. I'd love to see this. I've heard all about it but not even read the book either. Just the thing for a cold night away in the family motorhome. I would like to win because I haven't seen the film yet but would really like to! I have seen the trailer for this and it is definitely something that is on my to watch list! I MISSED THE CHANCE TO SEE THIS AT THE CINEMA AS I WAS PREGNANT AND NOT VERY WELL - SO I WOULD LIKE TO CATCH UP AND SEE WHAT THE FUSS WAS ABOUT! I'd love to win this DVD as I read the book on holiday in March and loved it! I adored the book when I read it several years ago. It had a huge impact on me and I would love to see the film.